US President wishes the Jewish people a Happy New Year. 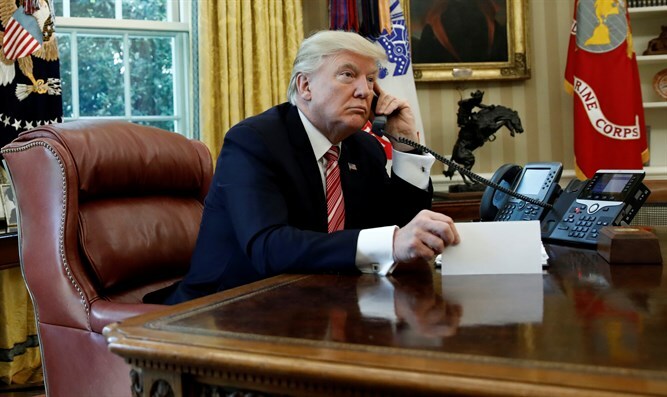 US President Donald Trump wished the Jewish people a Happy New Year ahead of the holiday of Rosh Hashanah, which begins at sundown on Sunday. “Melania and I wish all Jewish people Shana Tova and send our warmest greetings to those celebrating Rosh Hashanah and the start of the High Holy Days,” he said in a statement released by the White House. “Rosh Hashanah is the beginning of the New Year in the Jewish faith. Far and wide, the trumpet of the shofar signals both a time of reflection and repentance. Along with devout prayer and fellowship, Jews worldwide will practice teshuva during the Ten Days of Repentance to deepen their relationship with God,” continued Trump. “Melania and I pray that the High Holy Days are filled with God’s peace, love, and mercy. We wish a blessed and happy New Year to all those observing Rosh Hashanah,” concluded the President. On Thursday, Trump spoke with Jewish leaders in a conference call ahead of Rosh Hashanah and Yom Kippur. During the call, the president highlighted his accomplishments over the past year, including upholding his promise to relocate the US embassy from Tel Aviv to Jerusalem, the deportation of Nazi war criminal Jakiw Palij, withdrawing the US from the United Nations Human Rights Council – citing its anti-Israel bias – and pulling out of the 2015 Iran nuclear deal. Known as the “High Holy Day Conference Call”, the tradition started in the Obama administration, and continued on with his successor.